Search Results for "male lion"
Lioness sits next to male lion on yellow grass in Greater Kruger National Park in South Africa. Lioness looks over male lion’s head. Trees in the background. Slow zoom in. Close view of young nomadic male lion in Greater Kruger National Park in South Africa. Lion sits up and looks around. Slow pan to another lion. Grass and bushes in background. Older Male Lion Mounts And Copulates Another Male To Show Dominance. Close-up of exhausted male lion panting with flies in its face. Green grass and bushes surround the lion in Greater Kruger National Park in South Africa. Slow zoom out. Young Male Lion Sitting In Sandy Riverbed. Lion Turns Looking Directly At Camera. Close view of young male lion lying on yellow grass in Greater Kruger National Park in South Africa. Lion is drowsy and has trouble keeping eyes open. Close view of male lion blinking its eyes and looking toward camera lens. Lion lies down on grass in Greater Kruger National Park in South Africa. Male lion smells leaves and rubs mane on tree branches above its head in Greater Kruger National Park in South Africa. Lion marks his territory. Grass and trees in background. Close view of old male lion grooming/licking its paw and leg in Greater Kruger National park in South Africa. Lion lies on ground with grass and twigs around it. Male lion lays head down to fall asleep in Greater Kruger National Park, South Africa. Lion is lying on yellow grass on the savannah. HD Video of two male lion resting in green grass, looking around then flops on side to look at viewer. The lion is one of the most widely recognized animal symbols in human culture. White Lion, king of the jungle. Handsome portrait of RARE white male lion, Pamthera leo, relaxing in the grass. Medium shot of a Male Lion (Panthera leo) lying down panting and looking around. 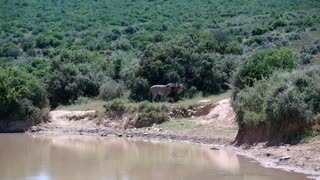 Note: this is not a captive animal in a zoo or theme park - this lion is wild and filmed on location in Africa without any interference from our film crew. Zoom out from close view of a male lion to wide frame showing another lion who feeds on a kill. Vultures in the background. 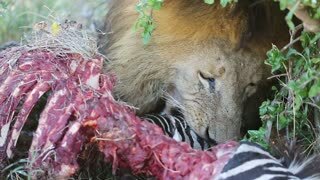 Male lion with gash/wound in its face feeding on a warthog in the darkness. Spotlight shines on lion and its kill at night in Greater Kruger National Park in South Africa. Young male lion with upright posture lies on grass and looks around in Greater Kruger National Park in South Africa. Morning sun shines on yellow grass and green bushes around the lion. Lion and Lioness Watching Over Surroundings Male Lion Flops Onto His Side To Sleep. Male lion kissing Lioness before laying down with other lion. African lion close up, eating prey. Shot of male lion, Panthera leo, chewing remains of his kill. Close view of male lion grooming/licking its paw in the darkness. Spotlight shines on the face of the lion in Greater Kruger National Park in South Africa. Zoom in and out. Close view of male lion with gash/wound in its face grooming its paw. Dry yellow grass surrounds the lion in the sunlight in Greater Kruger National Park in South Africa. Close view of young male lion lying down among dry grass in Greater Kruger National Park in South Africa. Lion is drowsy and lays its head down to fall asleep. Close-up of a young male lion lying down in the early morning sun in Greater Kruger National Park in South Africa. The head of another lion suddenly appears beside it. Male lion lies down on yellow grass in Greater Kruger National Park in South Africa. Lion looks toward camera lens and then looks away. Female lion attacks male lion. Kgalagadi Transfortier Park, South Africa. Male lion lying on road gets up and walks along road with other lion. A male liger and a female liger in Hainan Tropical Wildlife Park and Botanical Garden. The liger is a hybrid offspring of a male lion and a female tiger. Ligers have a tiger-like striped pattern but looks more like lions.